With an increased demand for solutions capable of bringing down operation costs and improving profit margins from oil and gas companies who are looking to every possible way to emerge from a very recent phase of massive price drops in key products, IoT solutions companies serving the global energy industry can look ahead to promising growth opportunities, observes Transparency Market Research in a recent report. Some of the leading companies in the global IoT market for energy industry are Davra Networks, Carriots, AGT International, Cisco, Accenture, and Tego Inc. 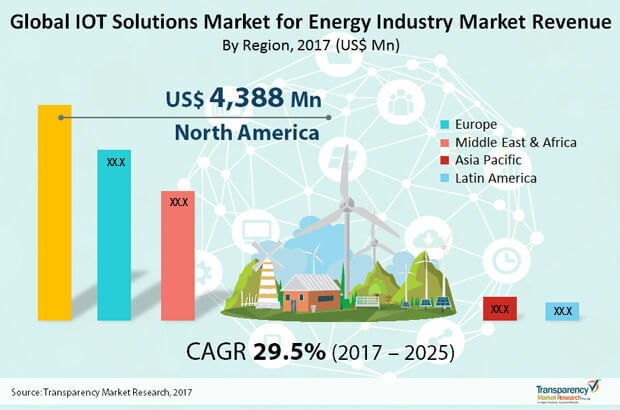 According to the report, the global IoT solutions market in the energy industry stood at US$9,300.9 mn in 2016 and is likely to rise to a valuation of US$94,011.8 mn by 2025, expanding at an impressive CAGR of 29.5% between 2017 and 2025. Of the key end-use industries in the power sector making use of IoT solutions, the oil and gas industry accounts for a lion’s share of the market, holding nearly 72% in 2016. Geographically, the North America market accounted for the dominant share in the said year. The global power generation industry has expanded considerably over the last decade has seen a vast rise in expenditure for the improvement of residential, commercial, and industrial infrastructure along with an increased focus on energy conservation initiatives so as to remain competitive. With IoT systems in place, the provision of real-time data about parameters such as voltage fluctuations can provide early warning signs of equipment failure and ensure proper allocation of maintenance crews. The increased understanding of these benefits is likely to bring about a considerable increase in the overall demand for IOT systems for grid control and power metering in the near future. Demand for IOT solutions in the energy industry will be driven by security concerns, and for purposes such as optimization, monitoring of operations, minimizing the demand-supply gap, and combating cyber threat. Governments of several countries are increasingly shifting towards green energy owing to increased global warming and excess depletion of fossil fuel reserves. With several countries, such as Australia eying to go 100% renewable by 2030, demand for smart monitoring systems capable of warranting a smooth transition from conventional power to renewables is likely to see a massive rise. This has paved ways for deployment of IoT solution in the renewable industries across the globe. Capacity expansions of existing solar and wind power plants is expected to drive the demand for IOT solutions in near future. One of the key factors hindering the growth of the global IoT solutions market for energy industry is government regulations on IoT Industry. The success of the idea of connecting devices to make them more efficient is dependent upon access to and storage and processing of data that could be sometimes confidential, which could dissuade government bodies from adopting IoT solutions in the first place. Nevertheless, companies in the market can benefit from the rising set of opportunities in the oil and gas industry. Through the use of IoT systems, companies in the oil and gas industry have started to optimize their operations and bring down their capital and operating costs. With a couple of unexpected rough years in the recent past, oil and gas companies are looking to exploit every opportunity to bring down costs to remain competitive, which could, in turn, fare well for the IoT solutions market in the near future.